If you’re anything like me, you’re always looking for ways to do things faster. I’m on a never ending journey of becoming more effective and efficient in my daily workflow. One of the components of most people’s workflow is a task list. I’ve been using RememberTheMilk.com (RTM) as my task manager for a few years (excluding a brief experiment with Google Tasks) and I can’t imagine trying to be productive without it. There are a TON of ways to add tasks to your lists, but one of my personal favorites is using a combination of their add tasks via email feature (you’re given a unique email address that allows you to add tasks) and a newer feature called Smart Add. It’s a trick I picked up from the book Bit Literacy. If I get an email that requires an action on my part, I’ll forward the email to RTM and just change the subject line to something that helps me remember what I’m supposed to do. The body of the text is attached to the task as a note, which is nice to have to get a context for the task. The downside to this method for me has been I can’t easily remember some of the feature codes for Smart Add, which I like to use. They have a lengthy discussion on how Smart Add works, but I don’t need all that. I just need the codes. 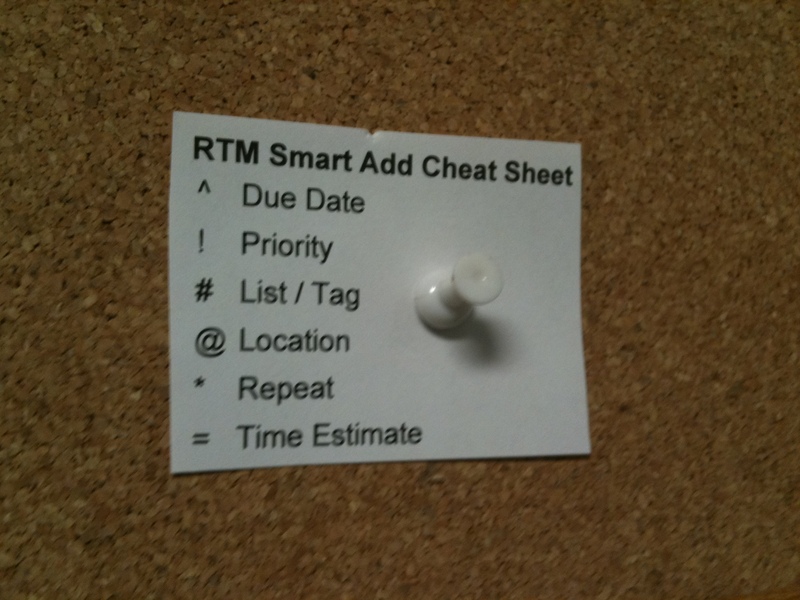 I fixed my little problem today by typing up a nice little cheat sheet that I tacked to my cork board. Now I’ll be able to have a little more control over my tasks via email and you can too. Just print out the doc or this blog post, cut the cheat sheet up to your preferred size, and you’ll be all set. If you use RTM and you have a tip I’d love to hear it! Share in the comments. Feel free to use it but don’t blame me for bugs or problems! – Uses smart add features to quickly add due date, priority, tags, list, time estimates etc. to your task. Feature request and bug reports are welcome as comments to this post. Thanks for sharing. I’ll check it out when I’m back on my laptop! One thing I’m missing on smart add is the ability to add a short note. As the task is not automatically selected anymore when using smart add, one needs to locate it afterwards and then add note. I especially use it to keep track discussion etc. Maybe we can rally some support to get it added? That’s a good idea. If you email to RTM you can use the codes and the email body will be added as the note. Great program, thank you for creating it! Thanks Keith! How long have you been a RememberTheMilk user?